Throwback Thursday, also known as #throwbackthursday and #tbt, is a special day of the week where people share photos from yesteryear on social networks. 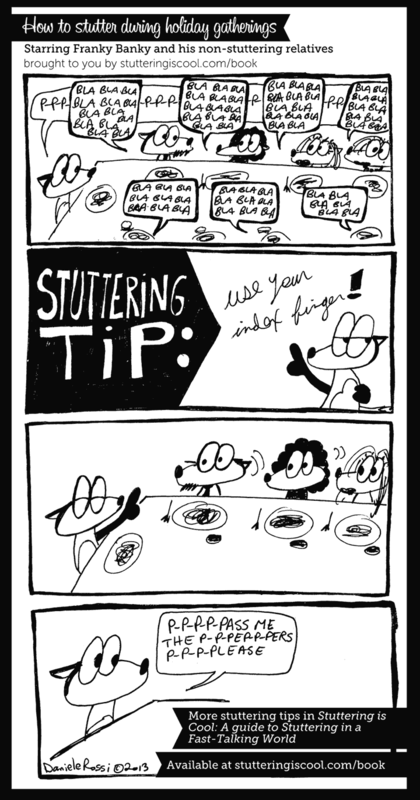 In the spirit of #tbt today, I’m sharing the above infographic comic I originally posted on Facebook, Twitter and Pinterest last year to coincide with the recent launch of my book, Stuttering is Cool: A Guide to Stuttering in a Fast-Talking World. Holiday gatherings can be stressful for anyone regardless of speech fluency. And trying to get your words out in group conversations can be quite challenging. As the subtitle of my book describes, we live in a fast-talking world. Or at least, everyone around us, the 99% who don’t stutter, need far less time to say what they need to say than we do. Add the loud volume of many conversations around the dinner table in a dining room and you’ve got one heck of a challenge to participate. The tip illustrated by Franky Banky comes from Danette Fitzgerald who I interviewed on my podcast in 2013. In that episode, she explained how using visual methods can be an easy way to signal that you’d like to say something no matter what the noise level may be in the room. That’s when I thought it would make a great infographic comic. From time to time, I use this method of signalling that I have something to say. Even during meetings at work. And it works. Sometimes discussions around the holiday table can get quite animated so you need to make sure that everyone can actually see your signal! Previous Post What kind of response are you after?